I’m going to tell you a very sad and very wondrous story. A little over 250 years ago, when America was still a colony of England, a young girl about 7 years old was abducted in West Africa by men who took and sold human beings for profit. This enterprise then shipped her across the ocean along with other abductees. This business, a very profitable and respectable business of the time, was slavery. The way this business worked then, those who were deemed useful for labor would be shipped to the West Indies. There some were put to work as slaves, and others were—to use the term sometimes applied to the harnessing of wild horses—“broken,” so that they could be more useful as laboring slaves. In this case, with this ship, it took those that were not figured to be the good laborers— the odd lots and freight salvage of their cargo—and carried them on to Boston in the American colonies. Our 7 year old girl was one of those less valuable pieces of cargo. And when she arrived in Boston, she was also sick, and so she was sold to a family for a very low price, because the ships master figured that if he didn’t sell her quickly she would die and there would be no profit in her. The family that bought this girl treated her unusually. They named her Phillis, as that was the name of the ship that carried her away to America, and as was the custom, used the family’s last name Wheatley for her as well. They taught Phillis Wheatley to read and write English, and then as she showed extra facility with language, they allowed her to extend her learning. By the time she was teenager she was reading not just the Bible, but Greek and Latin classics and the works of the leading English classical writers of the time. And something even more remarkable happened: she started writing like these men. Nothing like this had ever been seen. An American, in the far-off colonies, writing like an educated Englishman. No, an American woman—wait, not just a woman, an African-American woman, a slave, someone’s property, writing like an educated Englishman! Did the business of enslavement of Africans, the thing that brought this girl to America, arise because of a belief in the inferiority of black Africans? Or did the widespread belief that black Africans were mentally and spiritually inferior become widespread because it allowed otherwise moral human beings to take part in this repulsive practice? Whichever, Phillis Wheatley, this young girl, had become a wondrous rebuke to those ideas of racial superiority. In 1773, only 20 years old, Phillis Wheatley once more crossed the ocean and traveled to England, met Lords, Ladies, Counts and Countesses. A book of her poems was published there, the first book of poems by an African-American ever published. She was even going to meet King George, but she had to return to Boston before a date could be arranged. Back in America, as the foment leading to the American Revolution began, she wrote a poem to King George, reminding him that she was his loyal subject, but it might be wise to reconsider things like the Stamp Act that were riling up the colonies. Yesterday, February 22nd was George Washington’s birthday, and three days ago I celebrated the holiday that replaced Washington’s Birthday with a piece based on a poem written by the teenaged Washington. After the Revolutionary War broke out, and Washington became the commander of the American forces, Phillis Wheatley wrote a poem and sent it to General Washington. Washington wrote back that he was impressed by her “great poetical talents” and suggested that if it could be worked out, he would “be happy to see a person so favoured by the Muses.” Alas, as with the King George, this meeting with the General (and slaveholder) never happened. 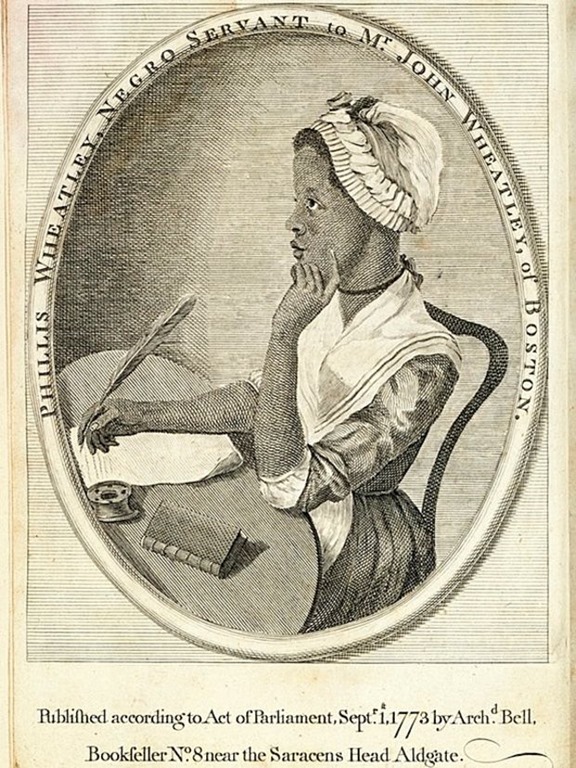 So here is Phillis Wheatley, a person who was abducted, torn from her family and home, sold for a pittance as damaged property, shipped across an ocean to a new land that speaks another language. She owns nothing, she herself is owned. And what then does she obtain? Poetry. The ability to speak fluently in the voice and art of this land of exile, and for a time, a measure of fame for this accomplishment. Is that enough? I look at her words now, over 250 years later, and the style she wrote in is so mannered, often encrusted with the gilded and blushed Georgian portraits of Roman myths. I told you at the start: this story is sad and wondrous. We know, it is our obligation to know, the sadness of slavery, committed by humans on other humans. The wonder of what Phillis Wheatley was able to accomplish fades somewhat with time. As a small gesture to that wonder, today’s piece “Hymn to Evening” uses a lyrical pastoral Phillis Wheatley wrote, wrapped in some music I composed and performed. A few words about the music in this piece. The first line of Wheatley’s poem “Soon as the sun forsook the eastern main” somehow reminded me of an excellent if little-known Joni Mitchell song “Eastern Rain,” perhaps best known in an elaborate arrangement performed by Fairport Convention. I find that having an inexact memory is a benefit to composition, as my musical result has nothing in common with Mitchell’s, and the only thing I took from Fairport Convention’s version was a vaguely East Indian musical feel. To hear my music and Phillis Wheatley’s “Hymn to Evening,” use the player below.